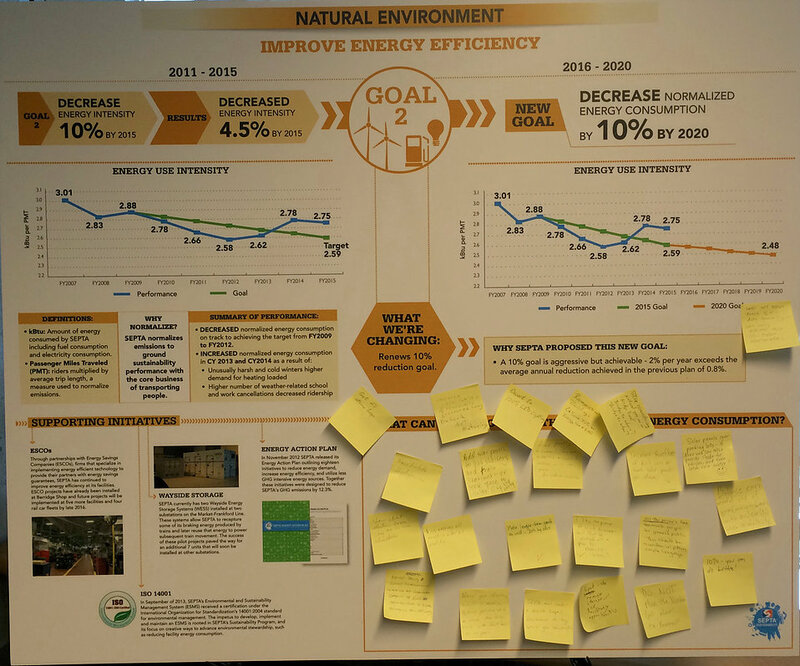 At their recent sustainability open house on August 30th, SEPTA displayed their top 13 goals for the economy, community and the natural environment on poster boards, as part of their SEPTAinable 2020 initiative. But we learned quickly that there was only so much that could be gleaned from simply looking at these boards. First of all, we commend SEPTA for investing in 25 electric buses. In discussions with staff members, we learned that SEPTA is looking into wind energy, and in response to SEPTA’s recent invitation to install rooftop solar, about 11 solar developers have expressed interest. However, we got the feeling that SEPTA is still pretty set on the idea that a CHP natural gas power plant at Midvale is necessary for backup power. A combined heat & power plant is often considered to be more efficient since it uses the heat generated from burning fossil fuels to heat water for building heat and use. On the posters, however, the proposed Midvale plant was described mainly as a way to reduce greenhouse gas emissions, with a secondary goal of maintaining train service during a grid outage. Again, in discussions, we learned that SEPTA is basing its standards on the EPA, which he told us promotes CHP plants. “And it’s your word against the EPA,” he concluded. The Environmental Protection Agency is often seen as the watchdog for the U.S.’s environmental standards. And indeed, we need the EPA. That said, its standards tend more towards reactionary than proactive. Rather than being proven safe before they can hit shelves, for instance, we often see chemicals that linger at checkout aisles until they are proven toxic. One notable example of this is DDT: it took the EPA years to figure out it was thinning eagle eggs. The EPA has failed to monitor and regulate the natural gas industry properly, by underestimating methane leaks, and by misrepresenting data gathered by their scientists about the impact of fracking on water quality. In addition, the targets for emissions reductions that are embodied in the EPA’s Clean Power Plan are not nearly strong enough to ensure that we limit global warming to less than 2 degrees, part of the Paris climate agreement in December 2015. Also, there is currently no EPA standard for ultrafine particulate pollution, which is likely one of the most important types of pollution emitted by gas-fired power plants. When it comes to climate change, we don’t have time to wait anymore. It’s a crisis. Judging by the crowd at the open house, we feel that we’re not the only ones concerned that the EPA standards can be too lax, especially when it comes to our current climate crisis. Upon entry, each of us was given post-its and pens so we could put our recommendations and comments on each goal board. The environmental boards were saturated with suggestions on where to put more solar panels and pleas for SEPTA to phase out fossil fuels. 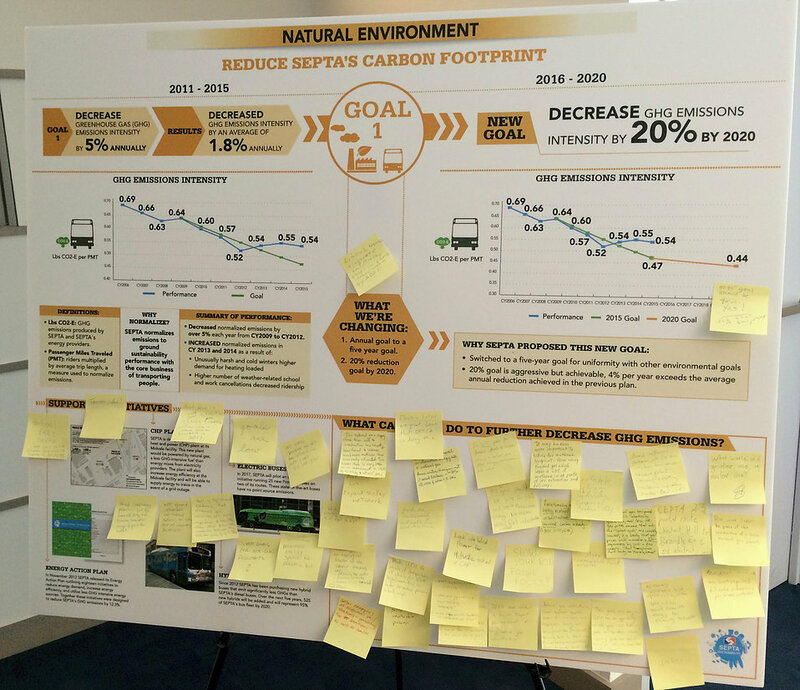 For instance, there was a board illustrating that SEPTA’s target for lowering greenhouse gas emissions intensity is a 20% reduction by 2020. Though at first glance this might mean switching to fuels that produce less emissions, know that emissions intensity is pegged to the GDP. So if SEPTA’s ridership grows, so do their emissions. 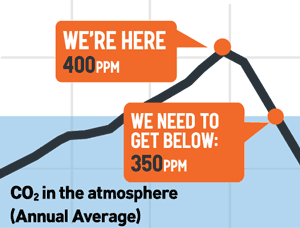 A more concrete measure of emission reduction would be an “absolute reduction”. Comments included a request for SEPTA to target a 50%, then 100% reduction in overall emissions (not just emissions intensity); and a statement that SEPTA shouldn’t fall for fossil fuels and instead opt for more wind and solar. Another target, to decrease “normalized” energy consumption 10% by 2020, was met with even more aggressive comments: “10%? You can do better,” “Do not build the Nicetown gas plant. Go renewable,” and “stop considering natural gas as a bridge fuel – bridge to where?” were some of our favorites. For the record, 44 other organizations in Philadelphia agree with our position on the proposed gas plant. Overall, we’re worried that SEPTA is not budgeting for the future. We love SEPTA–in fact, we all ride SEPTA! So we’re trying to help them better serve our community. The problem is that when we’re discussing issues like public health, job growth or climate change, we often need to think farther into the future than 2020: the date at which SEPTA hopes to meet each of the milestones on display. Posted on September 15, 2016 November 4, 2016 by 350philadelphiaPosted in emissions, SEPTATagged SEPTA.